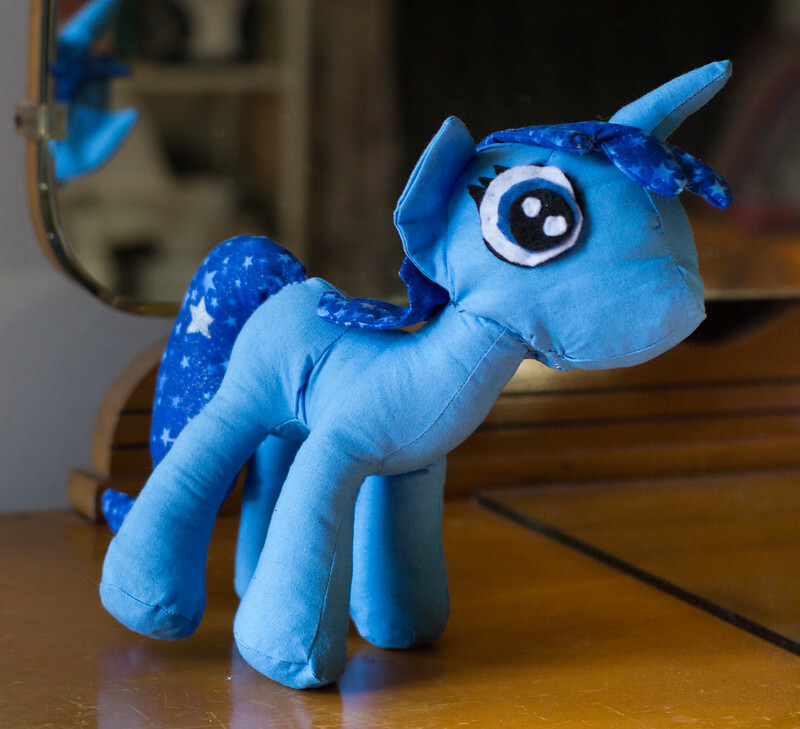 Blue starry math pony (using @valleyviolet’s pattern!) | Curiousity? 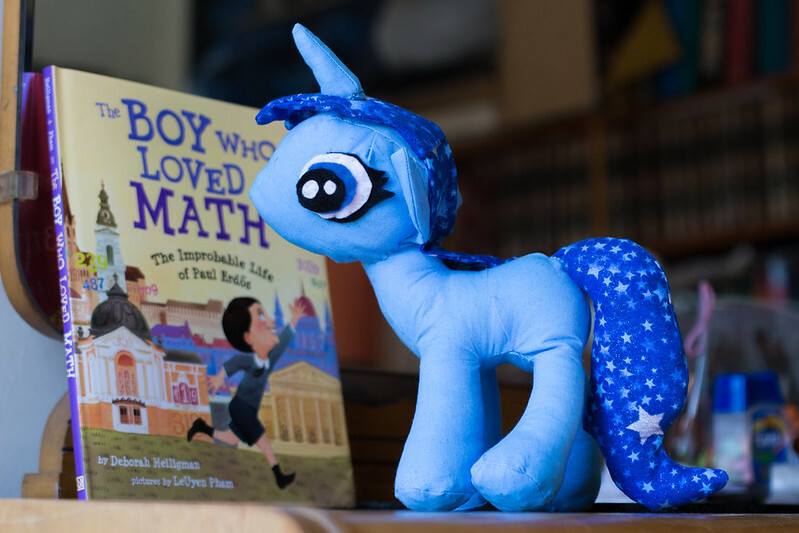 The book, as you can’t quite see in that photo, is “The Boy Who Loved Math: The Improbable Life of Paul Erdős.” I was super excited when I first heard of it, as it’s a beautifully illustrated children’s book about a rather famous mathematician. One of the things he did was travel the world, collaborating with mathematicans all over the place. Mathematicians sometimes talk about their Erdős Number, which indicates degrees of collaborators on your published papers leading back to the man himself. (I published a paper with someone who’s number is 2, so mine is 3, a number worthy of bragging about at math parties!). My Calculus prof, an excellent storyteller, used to tell us tales of Erdős at the end of class sometime, and I was totally enchanted to hear more of them through the book. And the art works a lot of careful math and real people into the story, which is amazing. I also love that it doesn’t shy away from the fact that he was a man who couldn’t do his own laundry but helped do so much math that people were willing to welcome him into their homes. I highly recommend it, especially if you’ve got a kid in your life who could use a gift! 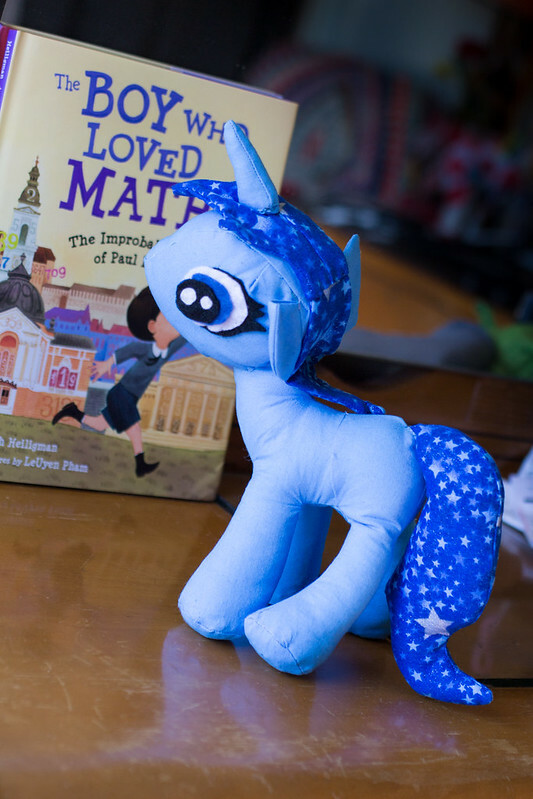 It’s also a kind of funny pairing with this pony, as some folk have this theory that one of the My Little Ponies with somewhat similar colouring also really likes math. Not an intentional joke on my part, but I’ll take it! Much like how representations of humans can have an uncanny valley effect if things are close but a little off, my experience is that this is a pattern that can go kind of horribly wrong if you don’t pay attention to the details. I originally sewed her head on in a weird way and was totally disappointed with the end result. I wasn’t even going to give it to V, it was so awful. I didn’t even take pictures (which is a shame in hindsight because the comparison was so striking). But after ruminating a while, I tried again, and with her nose tipped up just so, she got the curious look I was hoping for. Valleyviolet’s instructions are very detailed and clear, and there’s a lot of work put into the shaping that really shows in the final product. There’s also just a lot of thought put into the instructions. I’ve actually never worked with a pattern that was so careful about explaining things, and I’ve got to say the patterns are worth every penny as a result. 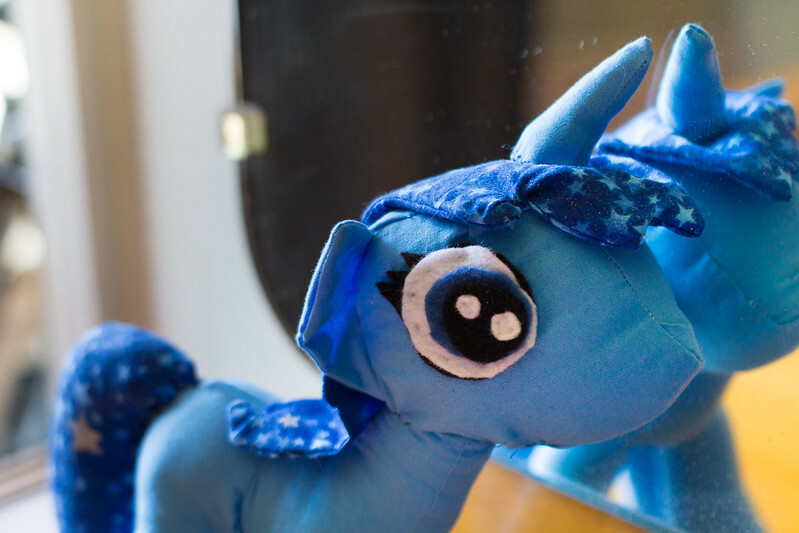 You can can buy her pony patterns here, and I promise you can make much more polished ponies than I did! 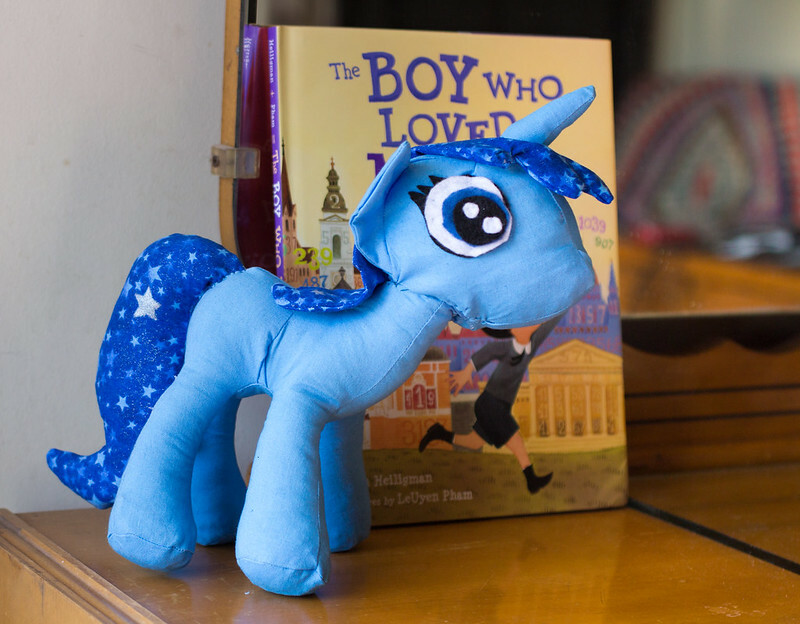 I don’t know how much the recipient cared for the pony, and to be honest she’s a bit young for the book yet, so I didn’t win any gift giving awards here, but it was fun to do and I really loved the pattern. I think I’m going to try out the shoulder pony pattern next, once I find some suitable beanbag filling! This entry was posted in gift, sewing. Bookmark the permalink.